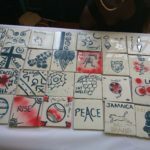 The Grade six students of Allman Town Primary recently created their last artefact – designed tiles – as a gift to the school’s canteen. The project was guided mostly by Mrs Nadine Bonner – Williams, grade 6 teacher of Allman Town Primary, and the OAaSIS International Anthea McGibbon . Other teachers assisting were Mr Toyan McLean, Mrs Cadena Lumsden-Walcott, Thamar Russell-Brown. 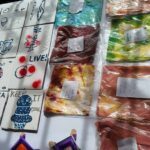 The tiles then formed part of the school leavers exhibition of art and craft put on by said Grade 6 students on July 3rd, 2017 transforming the canteen into a showroom. Over the year, students were taught how to do tye and dye and craft items including lanterns, baskets. The tiles were conceptualised in keeping with Jamaica’s Ministry Of Education’s mandate to incorporate Art in primary schools – STEAM. Steam is the curriculum based on the blend of Science, Technology, Engineering, Art and Mathematics. 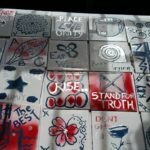 The design on the tiles reflected lessons learnt and the personal motto of the students. The students worked on them just after GSAT and just in time for the exhibition, July 3rd, 2017, a day before their own graduation. A student views the July 3, 2017 exhibition of works of art and craft made by the 2017 outgoing Grade 6. Exhibition of art and craft made by the 2017 outgoing Grade 6 students in the school’s canteen include tiles, tye and dye teeshirts. 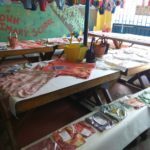 Exhibition of works of art and craft made by the 2017 outgoing Allman Town Primary School’s Grade 6. 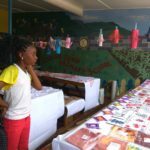 Exhibition of works of art and craft made by the 2017 outgoing Grade 6 students include baskets, tiles, lanterns etc..
Students of Allman Town Primary Grade Six work hard on tiles for upcoming art and craft exhibition on July 3rd, 2017. Exhibition of works of art and craft made by the 2017 outgoing Grade 6 students include tye and dye teeshirts, crafted lanterns, tiles. Tiles and tye and dye shirts displayed side by side at the exhibition of works by Allman Town Primary 2017 outgoing Grade sixers. Tiles designed by Grade 6 students with their mottos, are on display on July 3, 2017 exhibition in the school’s canteen. 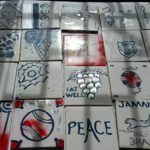 Designs and thoughts of students on the tiles reflect lessons learnt by students during their tenure. 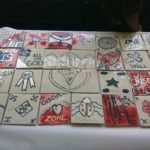 Tile’s design and thoughts of students reflect lessons learnt by students during their tenure at Allman Town Primary School. Exhibition of works of art and craft made by the 2017 outgoing Grade 6 students. 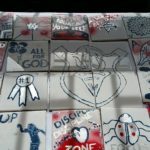 Principal Mrs Kandhi Lee Crooks Smith says the tiles will be used to adorn the wall of the canteen, while the craft items were on sale after the exhibition. 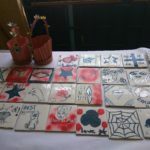 As artefacts, the tiles will be a tell tale to visitors about the 2017 set of Grade Sixers whose journey began at Allman Town Primary School. 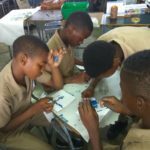 It is hoped that with proper funding, the current and future students of Allman Town will experience a more indepth art programme in response to Jamaica’s Ministry of Education’s mandate to fulfil the STEAM curriculum. OAaSIS International Foundation has already committed to more projects in art and literacy including creative writing. STEAM is the incorporation of Science, Technology, Engineering, Arts and Mathematics for the development of Jamaica’s youth and the nation.